I have to admit I was a little taken aback when I joined The Peloton and was told the whole team ate lunch together everyday and that I would be invited to take my turn to cook. I wasn’t sure about it at all. What if I don’t like the things other people cook? What if they don’t like what I cook? Do I really have to cook for 14 other people?! This concept also gets mixed reviews when I tell other people. Some people love the idea and others not so much, but most people are interested in if it “works”. I’m not sure what “works” really means in this scenario but I know it’s something I’ve come to really value and look forward to. It also feels like it’s at the centre of what makes us different from many other businesses, particularly Accountancy firms. Whoever is chef that day normally leaves their desk to start cooking at about 11.30 with the aim of serving up at 12.30. This hour is a lovely opportunity to take a step back, take a break from what you’re working on and focus on something totally different. We all know it’s not good for us to stare at a computer screen all day but very few of us do actually step away from our desks. When you’re on cooking duty you have to take this break otherwise everyone is going hungry. I was a bit daunted by cooking for such a large number of people, especially having to do it in the office in a relatively short window of time. But I did it and not only was it actually completely fine but it was really rewarding. Everyone was very grateful and it was a nice feeling to have provided for the whole team. It’s not a dictate but we do try to cook something nutritious and healthy each day. In Summer we’ll often have a huge salad full of goodies and Winter we’ll have warming fresh soups or hearty pasta dishes. We also always have fresh fruit and nuts available all day. We have our little treats like homemade cake and banger Fridays (every Friday we cook sausages for breakfast) but generally it’s all good stuff and fights off that sluggish feeling and those sugar crashes. Each person cooks roughly once every 2 weeks. So for nine out of ten days you don’t have to worry about lunch. No making sandwiches first thing in the morning or last thing at night and no trips to the nearest shop to buy something mediocre. We’re a busy office and it would be quite easy to go through a day without speaking to your colleagues much. We’re sociable creatures and most of us like to have a natter. But it’s often not the time to ask a colleague about what they got up to at the weekend when they’re trying to concentrate or about to take a call. There’s also always a feeling of ‘lovely, well I should probably get back to work’. Lunch is an opportunity to just chat guilt-free about anything and everything. It’s cost effective, and stress-free! Each member of the team pays a small contribution to the weekly Sainsbury’s shop which includes all of the food to cook the recipes as well as snacks and drinks. This works out much more cost-effective than bringing in our own food, and it’s one less thing we all need to remember on our own weekly shops. We worked out that a huge amount of everyone’s day was taken up by constant interruptions from people asking if you’ve ‘gotta minute’. We now have allocated times for each person where they are free to deal with questions. Lunch can also be one of these times. It’s unusual for any of us to miss lunch so it’s a pretty safe bet that you’ll be able to catch whoever you need to speak to. I know the names of each of my colleague’s partners and pets, I know where they live and what they like to do in their spare time. I know when things are good at home and I know when things are a bit tough. And I hasten to add they also know the same about me! So much of this comes from our lunchtime chats and because of it there’s a real feeling of being amongst friends, sometimes even family. Because we all take it in turns to cook then it’s a real leveller. We all do it and we all help clear up too. Most of the time it all works out great but sometimes we need a helping hand to chop up butternut squash or the sausages get burnt. And it never matters because we’ve all been there! 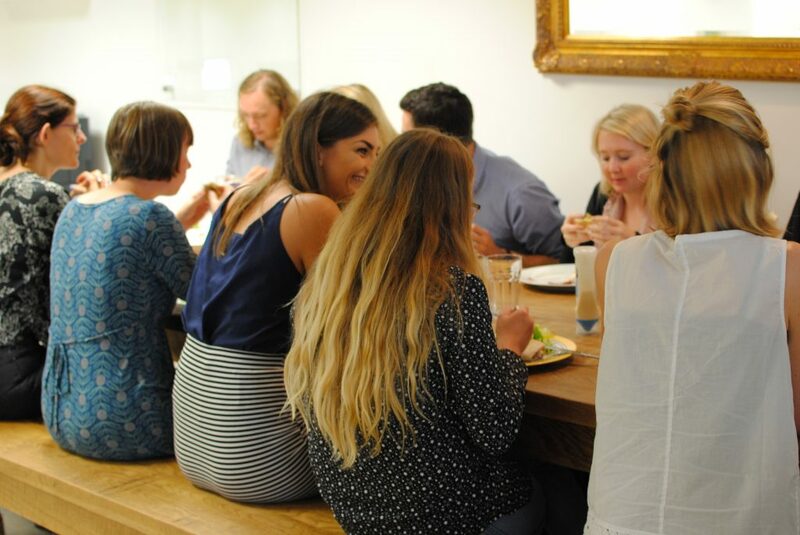 We also regularly welcome our clients and friends of The Peloton in for lunch. We’d love it if you wanted to join us one day.